A common, tall, cool-season pasture grass with short, creeping rootstocks, growing in heavy clumps with erect stems and often forming dense, solid stands. Leaves are coarse, 4-5 inches long, smooth on the undersurface and usually rough above. The erect panicles (compoundly branching flowering stalks) are somewhat narrow and contracted to slightly spreading, usually 2-10 inches long, and often nodding at the top. Flowers occur in flat, oval spikelets that are 1/4 to 1/2 inch long. There are usually 4-5 individual flowers in each spikelet. Blooms April through July (sometimes to October). Similar species: Meadow fescue (Festuca pratensis) is very similar and can be distinguished by its shorter height, thinner stem bases and less-robust habit; its not having hairs on the auricles (earlike structures where the leaf blade joins and bends at the stem); and its having usually 6-12 individual flowers within each spikelet. Some botanists place these two fescues into the genus Lolium. Missouri landowners who want more wildlife eradicate fescue to improve rabbit, quail and songbird habitat. Tall fescue and meadow fescue both occur in a variety of disturbed habitats—pastures, abandoned fields, roadsides, grazed woods, and along railroad tracks. They do well on poor, acidic soils in open sunlight and where there is little competition from other species. They tolerate a wide range of moisture conditions, are often planted on levees, and occur along stream banks. Where they grow in natural communities, they likely were spread by horses and cattle through manure. Statewide. Tall fescue is more common than meadow fescue in our state. Invasive. Fescue has been spread widely by cultivation throughout much of North America. This hardy perennial was introduced from Europe and is commonly sown for pasture and hay. It spreads primarily by seed to form dense stands. When it invades natural ecosystems, it can outcompete native plants and is difficult to eradicate. As the density of fescue increases at a site, species diversity decreases, in part due to fescue's release of substances that are toxic to nearby plants. Tall fescue and meadow fescue emerge early in spring and, after the seed matures in July and August, often form new growth in the fall. 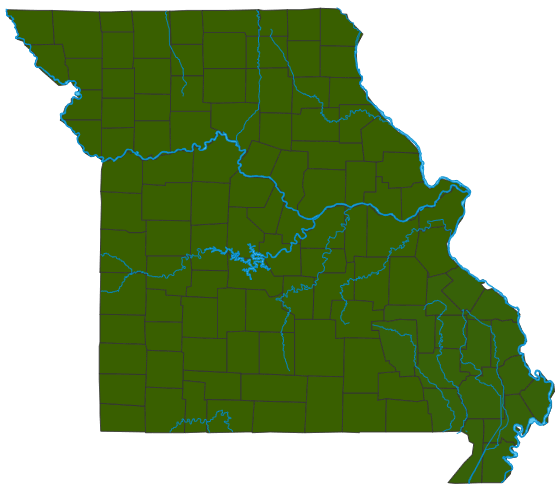 In southern Missouri, the leaves usually stay green all winter. These grasses are slow to become established, but once the heavy clumps are formed, they are difficult to eradicate. Tall and meadow fescues can harbor symbiotic fungi that in some situations can cause animal production and health problems, but the plants can withstand trampling and heavy grazing by livestock. Tall fescue, being drought resistant, is often used for lawns and to reduce soil erosion. Both fescues can invade open natural communities, such as prairies and glades, and can change the species composition and crowd out native species. These alien plants have the potential to become a significant problem because of their adaptability to poor sites and the difficulty of eradication.